The use of therapy that involved manipulation of the spine dates back to the time of Hippocrates, when he included manipulation in his healing repertoire. Development of modern chiropractic began in the late 1800’s with D.D.Palmer in Davenport, Iowa. In 1910, he wrote: “The chiropractic idea of disease and the adjusting of the vertebrae…is applicable to all animals that have vertebral back bones.” The Palmers practiced chiropractic on both people and animals. In 1985 Sharon Willoughby, DVM, DC founded “Options for Animals” and founded the AVCA in 1989. Many people are familiar with seeing a chiropractor for back or neck pain. 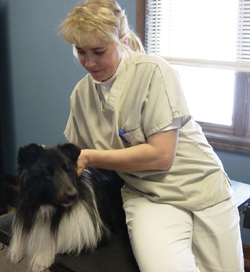 We often adjust the spine of animals for pain and/or stiffness in the back or neck, also. In addition, we view chiropractic as an important part of overall health care. A surprising number of problems that may seem unrelated to a “back problem,” actually are a direct result of a problem in the spine, which protects the spinal cord. All of the nerves that come out of the spinal cord exit between the individual vertebrae that make up the spine. When there is a vertebrae out of position it puts pressure on the nerves that pass by it. Often this results in back or neck pain at that spot. However, sometimes problems are seen further down the pathway of the affected nerve(s). These problems may be pain, spasm, lameness, or weakness in another area of the body, or problems with an internal organ that is the endpoint of the nerve. Therefore, we integrate a spinal/neurologic exam into the care we provide.